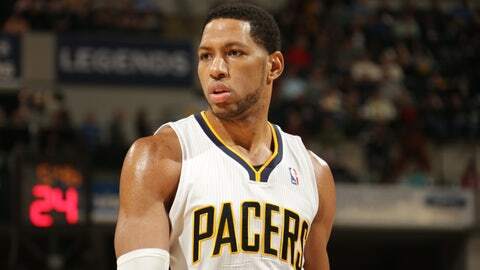 The addition of Danny Granger gives the Clippers more depth at the wing. LOS ANGELES — On his first day with the Clippers, Danny Granger got lost getting into the arena. He should know his way around Staples Center. As he said Saturday afternoon, he’s been there a thousand times in his nine previous seasons with the Indiana Pacers. But instead of riding on a team bus, he was driving a car. "I couldn’t find the players’ entrance," Granger said before making his Clippers debut. "I drove around Staples like five times." He should get more familiar as times goes on. As the Clippers’ latest acquisition — he joins Glen "Big Baby" Davis, who signed a free-agent contract last Monday — Granger will likely have a substantial role. Granger was inactive for Saturday night’s game against the Pelicans and will probably make his debut in a Clippers uniform on the road next Tuesday at Phoenix. Whether it’s as a starter or a bench player has yet to be decided. Coach Doc Rivers said Matt Barnes would be his starter against the New Orleans Pelicans on Saturday, but it’s possible Granger, 30, could work his way into the starting small forward position. "I don’t know the answer," Rivers said. "I have to wait and see how Danny fits with us. Ideally yeah, because of his length, and it would allow Matt to come off and do what he does with his energy. But Matt’s playing really well right now. It will all shake out." There’s also the question of Granger’s conditioning. Because of injuries, he has played just 34 games the past two seasons and averaged 22 minutes with the Pacers before he was traded to the Philadelphia 76ers. He and the Sixers then reached a buyout on his contract this week. Granger, who lives in L.A. during the offseason, hasn’t played since Feb. 19. "Throughout the week I was off, I trained, I worked out," he said. "Obviously, that doesn’t compare to real NBA minutes on the court, but I don’t think it’s terrible. I think I’ll get it back pretty quickly." His addition gives the Clippers more depth at the wing, although Barnes and Jared Dudley are likely to see their minutes reduced the more Granger plays. But Granger, a starter virtually his entire career, said he can adjust to whatever role he’s asked to play. "I just want to play, have fun, shoot some threes, throw some lobs and go celebrate."